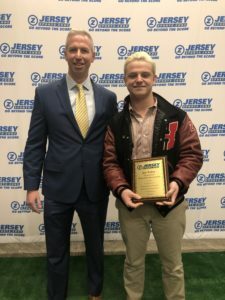 The 2018 Jersey Sports Zone banquet celebrated a stellar season on the gridiron in the Garden State. The APA Hotel in Woodbridge honored the best of the best from every part of the state and culminated with our version of the Heisman. Watch all the videos from a special night to honor the newest members of the JSZ All-Zone fraternity! 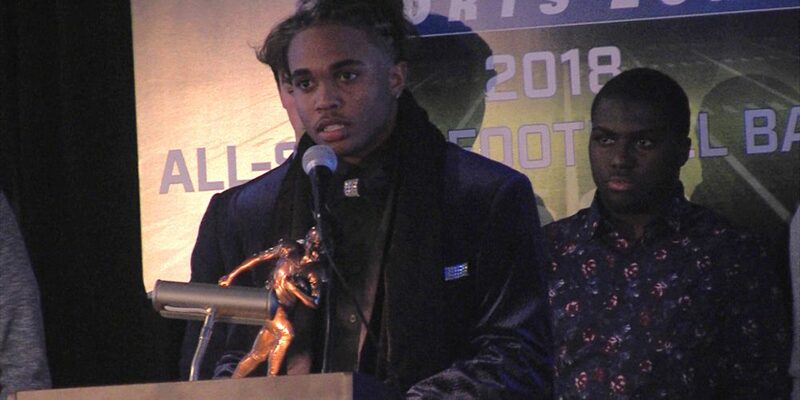 After a stellar senior year with Somerville, a majority of coaches and credentialed media from around the state selected Jalahn Dabney as the 2018 Zoneman Trophy winner. Dabney amassed 3,444 all-purpose yards and 55 touchdowns for the Pioneers this season. JSZ’s Jay Cook has the interview with Dabney along with other players selected to JSZ’s All-Zone team. Jersey Sports Zone’s Zoneman Trophy was presented by NJM Insurance. Thanks to their support of South Jersey high school sports all year long! With over 50 high school coaches around the state and more than 20 statewide media members, the ballots were cast just like the Heisman. 3 points or 1st place, 2 points for 2nd and 1 point for third. We will be posting our highlight videos of every player honored throughout the next day – check back to click on the links below and see our highlights from our 2018 JSZ All-Zoners! Thanks to everyone who voted in our weekly polls for the JSZ Top Play Belt and for our year-end Football Plays of the Year. Every one of these players was honored at the JSZ banquet in addition to the All-Zone team. Watch all their great plays NOW!